A subtle but important improvement in Outlook 2016 is the way the help system moves beyond helping you and almost tries to do things for you. That sounds creepy, but it’s not. It’s actually pretty useful. 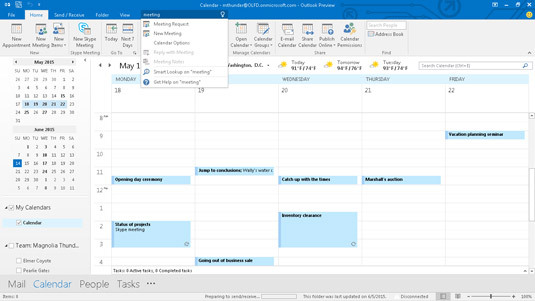 There’s a text box near the top of the screen containing the words “Tell me what you want to do. . .” When you click that box and type something you want to do with Outlook, it brings up a list that begins with links to things you can actually do. For example, if you type the word delete, it brings up a link to the delete command. Clicking that link deletes whatever Outlook item you have selected. If you type spell, the spell-check command appears. Click that and Outlook will conduct an automatic spelling and grammar check. Outlook shows you how to do what you need to do. Needless to say, you need to request something that Outlook can actually do for you. If you type in win the lottery or marry a millionaire, you may be disappointed in the choices Outlook can offer. But if you’re trying to do something involving email, appointments, or tasks, you may be in luck. Below the list of links, you’ll also see some other choices. One is called Smart Lookup, which uses Microsoft Bing — the company’s search engine — to look up the phrase you entered. If you type marry a millionaire and click the Smart Lookup link, you may find out about marriageable millionaires. The very last choice that appears is Get Help. Clicking that opens the Microsoft Help system, which explains how to do things with Outlook but doesn’t actually do those things. The Help system includes lots of blue text — just like you see in your web browser — which you can click to see more information about the blue-lettered topic.